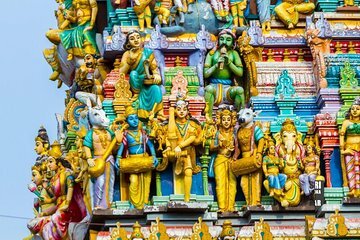 Learn about the history and culture of Colombo, Sri Lanka's capital city, on this half-day private tour. Enjoy personalized attention and a flexible itinerary on this private tour, including private hotel transportation, for just you and your party. I used the same car service for a private tour of the city. While the driver did not speak English that well, he was very attentive and patient with me as I visited several museums and shops. He also had a positive disposition. Wonderful tour visiting the oldest hotel in Colombo, all the major sights in Colombo, several Buddhist and Hindu temples and even receive a blessing from a monk. Couldn't have been better. Guide picked us up right from the dock by our cruise ship. I must tell the truth: my expectations about Colombo were low. The tour commenced with a visit to St. Antony's church and proceeded to other Buddhist and Hindu temples, plus a stop in the red mosque. The tour has covered nicely the entire town and our driver/guide, Kumar Vijesuriya was fantastic! He allowed us to set our pace, take thousands of photos, inquire about the places and the culture. Very knowledgeable. Actually, I must also thank Pathum Rodrigo, the tour organizer, who sent us a WhatsApp message prior the tour to welcome us and to advertise everything was on schedule. We left Colombo with that bitter-sweet feeling: so happy for being there and get to know its beauties. At the same time, so sad to leave. I highly recommend the tour, either if you have little time in town or want to see a glimpse of what Colombo has to offer. You left us very well impressed! Thanks! We enjoyed this tour but felt it would have benefited if we had a guide and driver. We were unable to go in temple as guide couldnt get parked. Also guides English was fairly limited. He was very helpful and keen to help though. Good tour. Also driver kindly took us to the airport at the end of the tour! Gave him a good tip! Godfrey our tour guide was excellent and had great knowledge of Colombo and Sri Lanka as a whole. Any tour group would be fortunate to have Godfrey as their guide. Good tour. Got to see lots of Sri Lanka. The tour guide/driver was really nice and took us to different places we wanted to see. The only place I wanted to see that we didn't get to go to was one of the open markets or the floating market. as well as others you'd like to see. We were very satifsied with our driver, excellent and clean car. Colombo was our first port stop of 16 nights and our guide Godfrey set a very high standard. He is very experienced, courteous, knowledgeable and a most careful driver in driving conditions which are quite testing. We enjoyed highly all the sights he drove us to and past. Our tour of the temple was made that much more valuable by Godfrey's commentary. We left Colombo feeling that we were really familiar with its main elements and our knowledge and understanding of its history and culture was down to Godfrey's knowledge and pride in both his work and his Country.